To Be Calimquim » Blog Archive » Let’s Fix the Seabirds – Challenge Accepted! [Ka-LIM-kim] – Filipino surname – for many, hard to pronounce – just say "Cal"
Let’s Fix the Seabirds – Challenge Accepted! 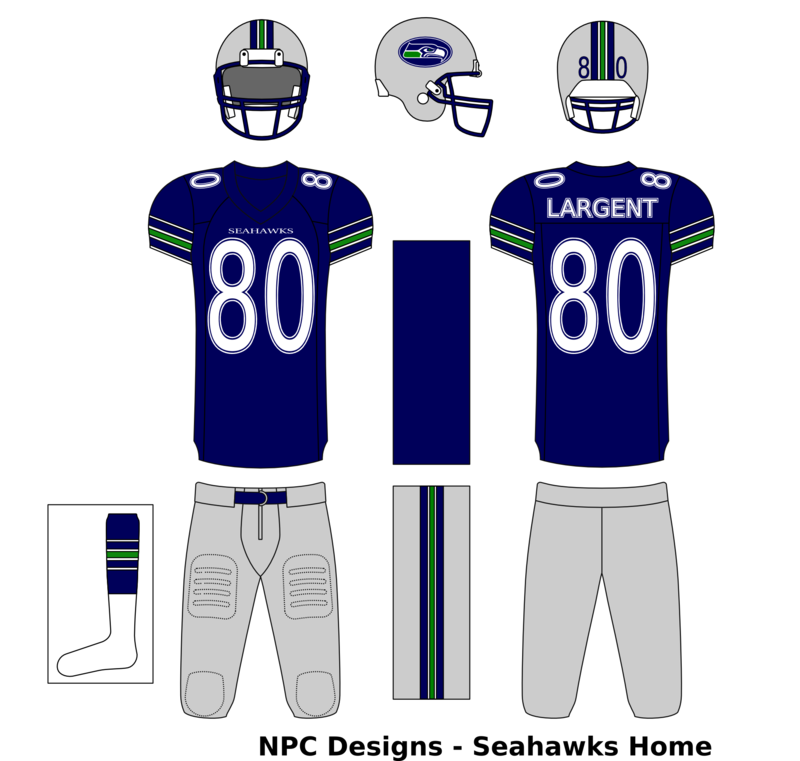 On the website Uni-Watch.com, Phil Hecken challenged the Seabirds … I hope he meant the Seahawks … fans to come up with a uniform redesign. The link to Phil’s original blog article is here. I have willingly accepted this challenge. Although there may be some prize involved for the best redesign submission, winning the prize is not my goal. My goal is to bring the Seahawks uniform back to the glory days of past and make it a more classic design, by which other uniforms are judged. I’m not a flash-in-the-pan Seahawks football fan. In fact, I’ve been following the Seahawks since they made their NFL debut in 1976. I’ve seen the highs of the Ground Chuck-Warner-Krieg-Largent era in the 80’s and early 90’s, and the Holmgren-Hasselbeck-Alexander era in the 2000’s. I’ve also suffered the lows of the mid 90’s with Seahawks teams led by QB’s Mirer and McGwire. 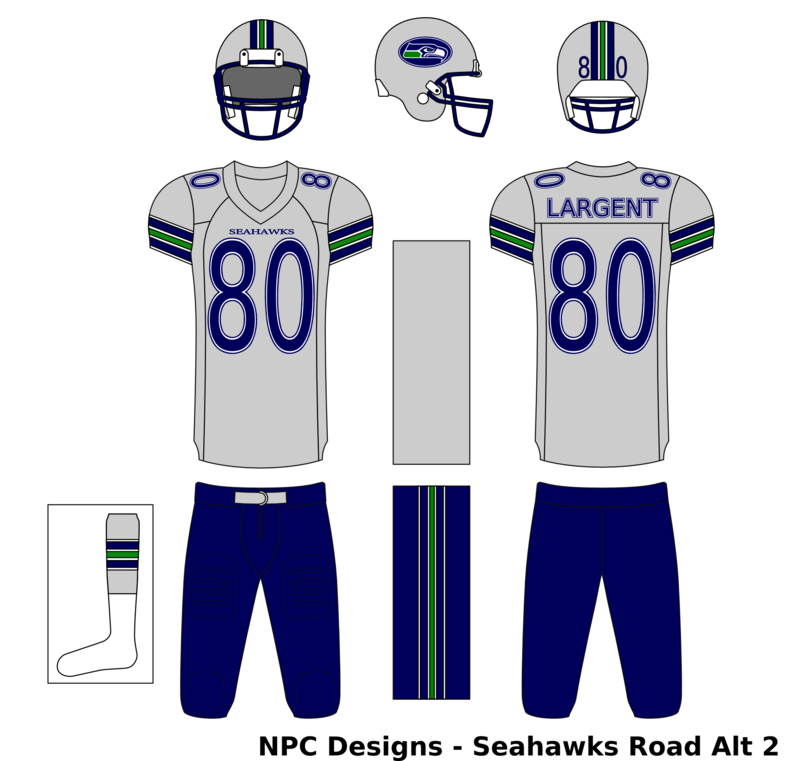 From 1976 to 2003, the Seahawks uniform stayed basically the same, with a few accent tweaks here and there. In my opinion, the design was okay, but it deviated from the NFL standards, especially the helmet’s Seahawk logo wrapping around to the back. 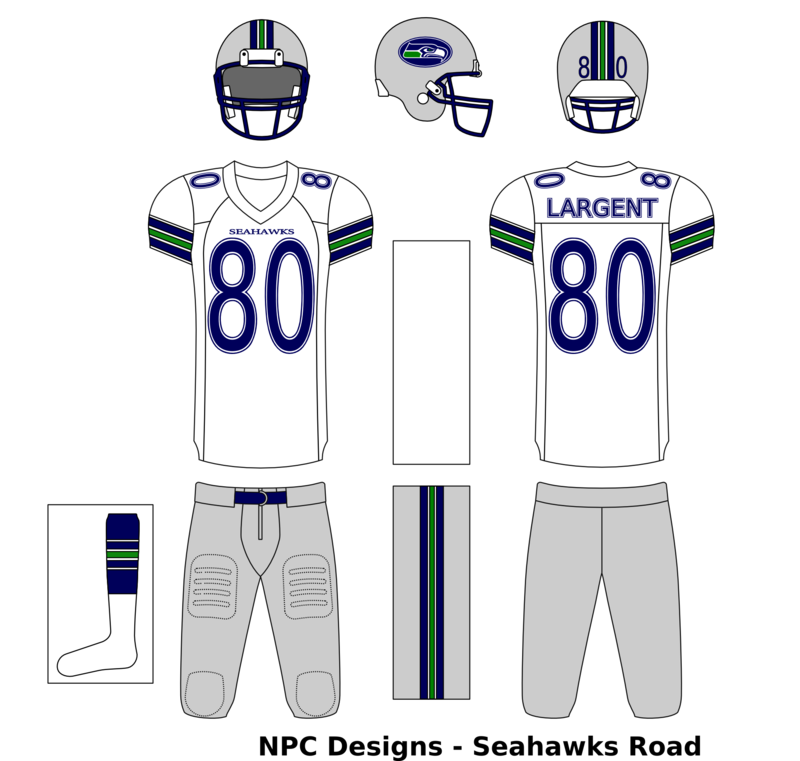 To coincide with the opening of their new football stadium, the Seattle Seahawks over-hauled their uniform design in 2002. 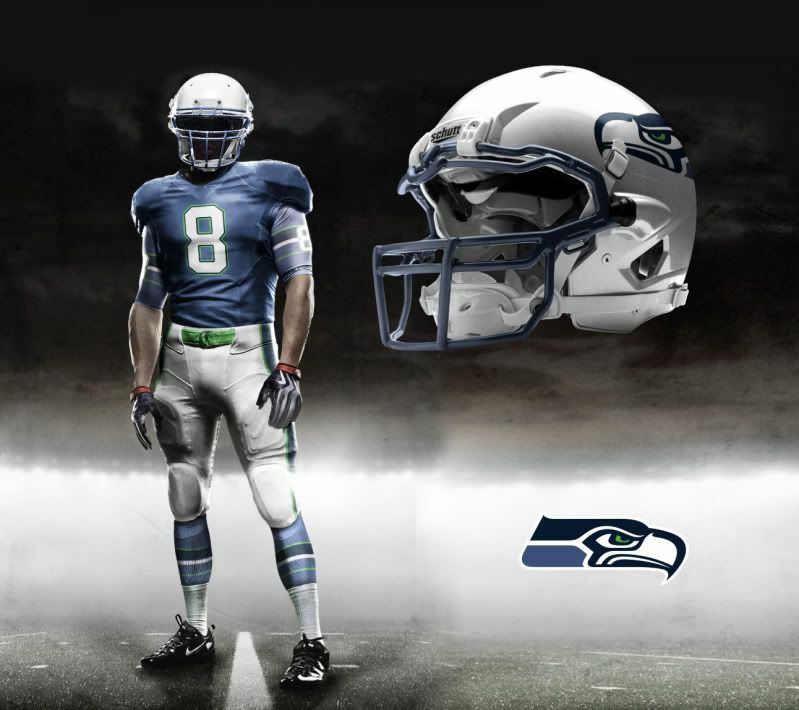 The most dramatic changes were the primary colors and the redesigned Seahawk logo. Put under a public vote, the Seahawks gave the fans two helmet options – the current silver color vs a darker gray/blue. I chose the darker colored helmet, which was the ultimate winner. Back then, the new colors seemed to offer a glimse of a better future for the Seahawks. 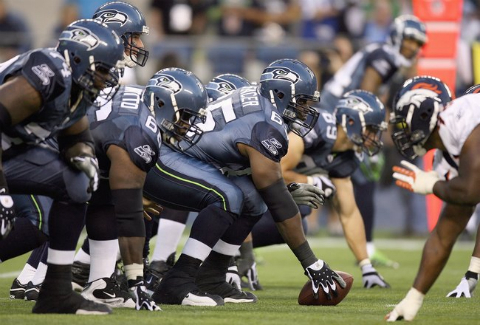 Amazingly, in 2005, the Seahawks reached the Super Bowl wearing these new unis. Don’t change what works, right? Wrong! Change is always good and if you’re changing to back to a more classic look, it is even better! Return the uniform design to a timeless, classic look. 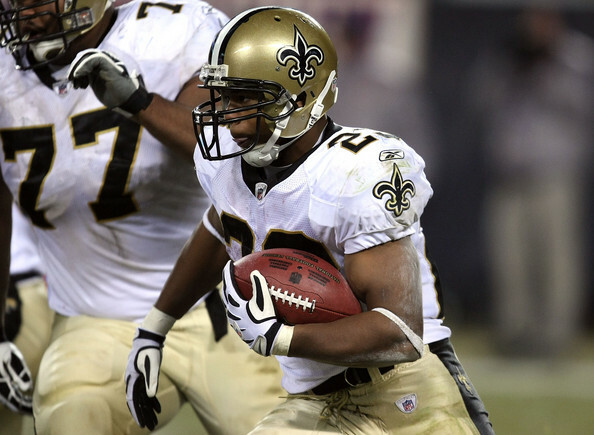 Take inspiration from the Bears, Packers, Colts, and Saints, whose uniforms have withstood the test of time. 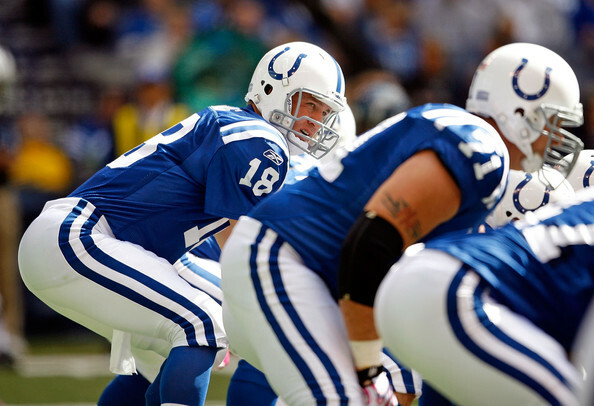 The helmets must be silver color, as they were originally – no more dark colored helmets. I’d like to also point out that I’m a UDub football fan. 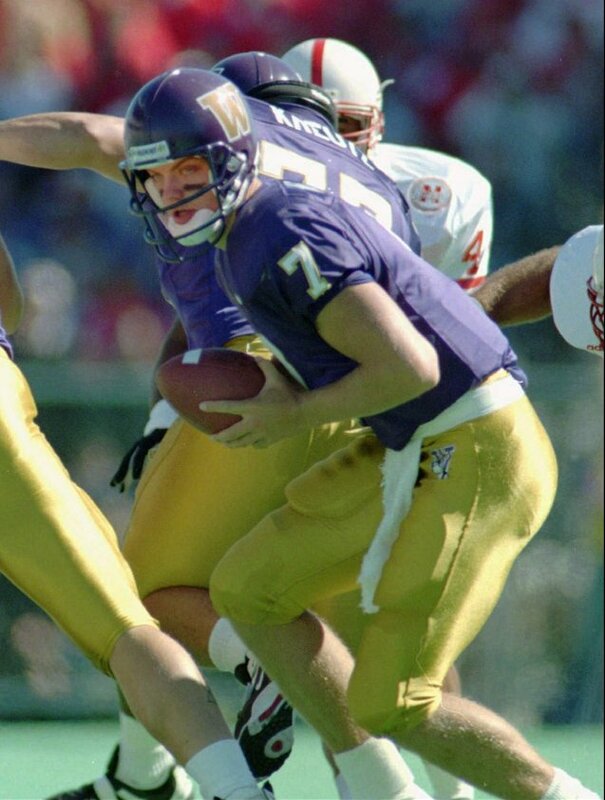 You cannot imagine my distaste when the Huskies unveiled those hideous dark purple helmets in the mid 90’s. Although the current Seahawks helmet looks good on television, the color must be silver in order to consider it a classic. I’ve seen the proposed white helmet version of the Nike Pro Combat uni. Sorry Phil, but the Seahawks play in the NFC West, not the Big 12 Conference. Use classic striping, especially on the pants’ sides, socks, sleeves, and most definitely the top of the helmet. I know most die-hard Seahawks fans may be against the helmet stripe, but the plain silver helmet on top, just won’t do. Use the original classic base colors from the past – navy blue, silver, and white. Green would be used sparingly, just for highlighting and striping. The Home and Road uniforms will always feature the silver pants. Furthermore, the two Road Alt uniforms in my redesign proposal will have navy blue pants, alternating between white and silver color jerseys. I will never suggest the one-piece dark look that resembles a full-body leotard. That is a tacky look, that you would never see on any classic NFL uniform. I just can’t imagine what went through the mind of the uniform designer that thought the single color unform looked good. Bleh! In my mind, it all starts with the helmet. 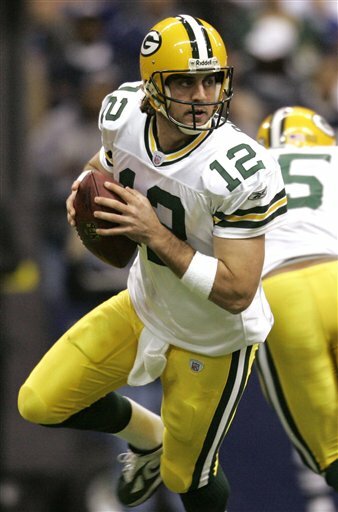 You get this right, and the rest of the uniform design comes naturally – case in point: Green Bay Packers. Get this wrong, and there’s no way to recover – case in point: Cincinnati Bengals. My classic uniform redesign will re-use the post 2002 Seahawk logo, with a few tweaks to the colors. Apart from the Seahawks helmets of the past, my proposed new helmet will definitely have striping on the top. All good, classic helmets should have some striping down the top middle of the helmet. 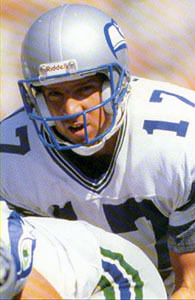 In my mind, the Cowboys have best helmet stripes in the business. As you will see later, the helmet striping will match the size and scale of the striping on the pants’ sides. The back of helmet will also feature the uni number of the respective player. The with facemask, I was torn in going with the navy blue face mask vs the old-school plain gray, which has been popular of late. 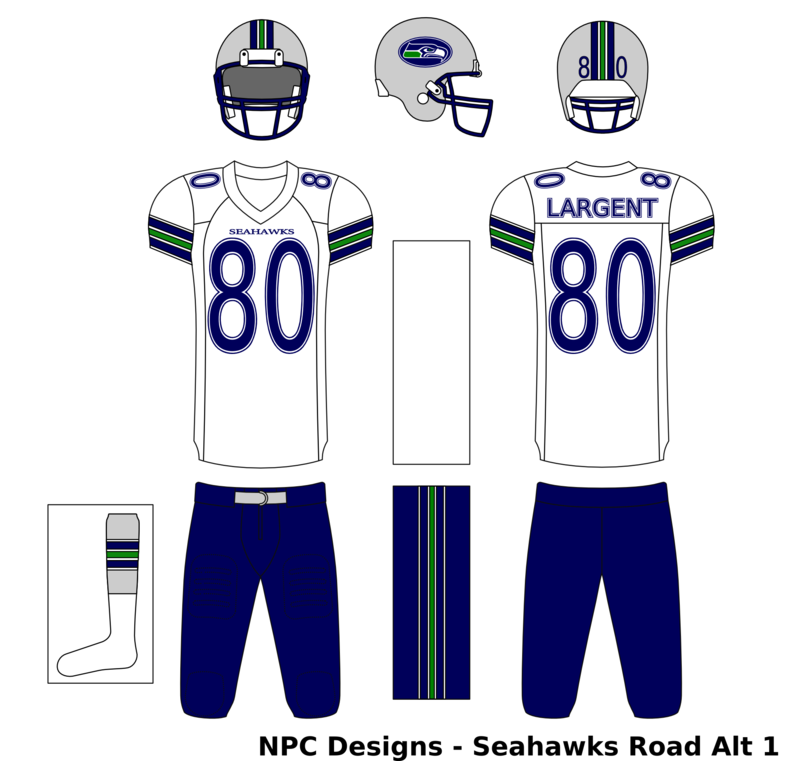 Harking back to the days of Krieg and Largent, my redesigns willl go with the navy blue facemask. Last but not least, I have changed the Seahawks logo to a more simplistic ellipse with the more newer, menacing logo filled inside. Unfortunately, having the original Seahawks logo wrapping to the back of the helmet does not look good, especially with the striping on the top of the helmet. I understand the hype of the Nike Pro Combat uni’s — they’re fresh and a break from the NFL norm. Unfortunately, Pro Combat unis will only look good on 25% of the players in the NFL. What about the other 75%? 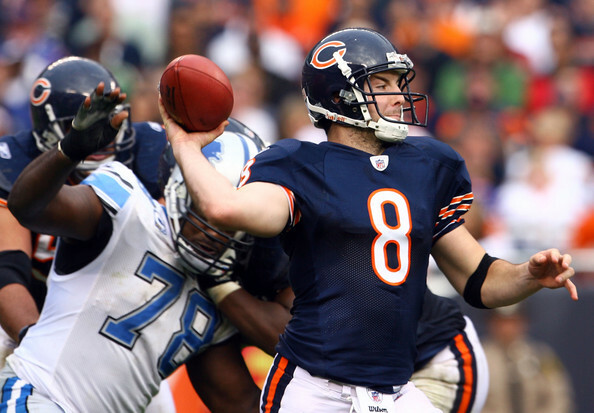 Furthermore, I do not like the form-fitting, skin tight sleeves that seem to be a separated from the jersey. My redesign will feature standard jersey sleeves that can have the option to stretch-fit around the upper arm or have a looser fit for QBs and punters. I have opted for standard striping on the sleeves, but avoided to put the Seahawks logo, since that would be overkill. The two logos on the helmet are plenty. As you will see later, the striping on the sleeves will mimic the size and scale of the striping of the socks. The numbers on the back, front, and on the shoulders will have a more modern font rather than the standard block lettering. Also, the individual numbers will be outlined, to make it look more classic. The player nameplate will also follow the modern font and individual letter outlining. For both the Home and Road uniform options, the pants will be silver in color — the shiny silver, not the dull gray pants that Giants currently wear. There will also be side striping on the pants. For symmetry, the pants striping size and scale will match that of the helmet striping. As with their helmet striping, the Cowboys have the best pants side striping in the NFL, especially when they wear the darker blue uniform scheme. Moreover, they need to cut down on the different shades of gray/silver/blue silver/blue that they have on the their regular Home unis. As a rule, the upper color of the socks should contrast that of the pants. I detest that leotard look when you have those colors match. Therefore, with silver pants, the socks’ upper color will be navy blue. With the navy blue pants, the socks’ upper color will be silver. For symmetry, the socks’ striping size and scale will match that of the sleeves’ striping. With my uniform redesign, either white or black shoes would match, although my preference would be white shoes for Home games and black shoes for Road games. Furthermore, I would avoid any neon color at all costs. The NFL should levy severe fines to those players caught wearing neon colored shoes. So without further adieu, the four links below show my proposed uniform redesigns. The picture files sizes are slightly larger than normal, but this will allow you to zoom into the details of each uniform. For any of you that are curious, I made these uniform redesigns using standard SVG (Scalable Vector Graphics) templates available for free online. Just do a Google search and you will find many to choose from. For the graphics software, I used the open-source software Inkscape, which is perfect for editing SVG files. Inkscape is available in both Windows and Mac versions. You can download Inkscape here. The Model 3 is officially here! The Palazzo and Venetian hotels in Las Vegas are now pet friendly! This blog template is built with validated CSS and XHTML, by N.Design Studio. Icons used here are from Web 2 Mini pack. To download more WordPress Themes, please visit www.ndesign-studio.com.